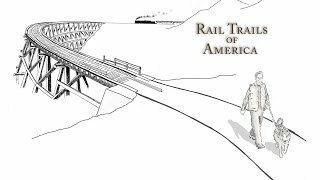 The United States is considered the first country to establish a structured social movement for rail trails with the establishment of the Rails-to-Trails Conservancy in 1986. This non-governmental organization argued for the “reuse of a resource—the recycling of a whole transportation system” that would not only recycle the transportation system, but also benefit recreationists, the conservation of local and national heritage, and environmental efforts (Fletcher, 2006: 16). As a consequence, today the United States is served by the widest and longest web of rail trails in the world, with more than 14,000 rail trails in the country, ranging from less than 1km to over 300km (Rails-to-Trails Conservancy, 2014). The Virginia Creeper Rail Trail in southwest Virginia generated through tourism in 2007 $1.6 million in output and more than 27 jobs in the local community. Rail trail tourist visits also generated about $921,000 in total value-added in the local economy (Bowker, Bergtron & Gill, 2007). Even when a rail trail is mainly used by local residents, which we do not believe will be the case with the Northern Rivers Rail Trail, they add a significant boost into the local economy. The Perkiomen Trail in Pennsylvania, USA, is almost entirely used by local residents for recreational and commuting purposes. More than 80% of users who are residents indicated they had purchased “hard goods” (bikes, bike accessories, clothing, etc.) in the previous year in conjunction with their use of the trail, which resulted in an average expenditure of $396.89. While these types of purchases are not annually recurring, even with the most conservative usage estimate they amount to millions of dollars in sales (Knoch & Tomes, 2008). A study of two recreational bicycle events on the Pere Marquette Rail Trail in Michigan, USA, found that for the first event (Michigander), average spent amounted to $233 per travel party. For the second event (Midwest Tandem Rally), the results were similarly positive: including the registration fee, participants and their travel parties spent $260,000 in conjunction with the event or $566 per travel party (average 2.5 persons). In addition, the economic impact of these events was found to likely extend into the future as 79% of the Michigander participants and 54% of the Midwest Tandem Rally participants said they are extremely or quite likely to ride the rail-trail again (Nelson et al., 2001). A study conducted in 2009 for the Gundagai Shire Council to assess the feasibility of the Murrumbidgee Valley Rail Trail indicated that $1.006 million/year was expected in direct additional expenditure as a result of a rail trail development in the region (Transplan Pty Ltd & Mike Halliburton Associates, 2009). A recent study conducted at the D&L Trail in eastern Pennsylvania indicated that the rail trail generates an annual economic impact of more than $19 million in the communities through which it passes (Rails-to-Trails Conservancy, 2014). In 2013, a study was conducted of six connected trails that make up the central leg of the developing 270-mile Erie to Pittsburgh Trail (EPT) and are located in northwest Pennsylvania. An analysis of the data accumulated from infrared counters located along the Trails and paper surveys received from users indicates an estimated 158,507 annual user visits to the combined Trails, resulting in a total economic impact in 2013 of $7,479,348 ($6,928,620 directly into the local economy). Compared to 2006 results, the 2013 survey confirms an annual increase in the trails’ total economic impact of more than $3 million (Tomes & Knoch, 2014). Just finished the Otago Central Rail Trail in NZ with 3 other couples. Truely amazing experience. I made a point to speak with the pub and accomodation owners, who are running very successful businesses, and they informed me that they would be shut if the rail trail was not operating. They even stated that the farmers that originally opposed the rail trail, now embraced it. Otago Rail Trail is an amazing and breathtaking trail. Whether it be walking,running,cycling or trotting you will want to keep going back unless we have one here on the Northern Rivers! Photos taken by Geoff Bensley and with permission to others to share.